Gombeen politicians still in charge??? Former taoiseach Bertie Ahern is to resign his membership of Fianna Fáil just days before the party’s National Executive meets to consider a motion to expel him. 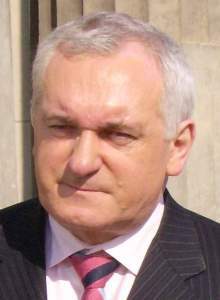 In an article in the Sunday Independent newspaper, Mr Ahern said he was “deeply saddened” by the tabling of a motion to expel him from the party which he led for 14 years. Fianna Fáil leader Micheál Martin yesterday confirmed his intention to seek the expulsion of Mr Ahern, former EU commissioner Pádraig Flynn and three others after they were criticised in the Mahon report. Garda Commissioner Martin Callinan has instructed the head of the Criminal Assets Bureau to take charge of investigations arising out of the planning tribunal’s report which identified widespread dishonesty and corruption in public life. This Gombeen politician should be in Jail, there are people in Jail because they have not paid their TV licence and this creep is raking in 157,000 euro from the people of Ireland every year .Where is justice in Ireland today .Corruption ,,Fraud ,bullyboy tactics and outright gansterisem is rewarded in the political system we are allowing to continue .We must now get up off our knees and take back our country from the likes of this creep and his buddies who continue to protect outright criminals on fat pensions and state perks .For God sake Ireland Get a set of Balls and get up and fight back! Fianna Fáil leader Micheal Martin has accused Fine Gael of “rank hypocrisy” over its position on severance payments and pensions for TDs and ministers. Reports today suggests Fine Gael leader Enda Kenny has deferred a €100,000 lump sum payment from his teachers’ pension due when he turns 60 in April until he retires from politics, when he will also be entitled to TDs and ministerial pensions. The Sunday Business Post reported that Mr Kenny would be due a €30,000 pension from teaching on top of his salary as a TD. Mr Martin said he felt the payments were “wrong” given Fine Gael had levied criticism on outgoing ministers for accepting severance payments. Mr Martin said he was the first minister to forego a severance payment and that Mr Kenny had not done this. “He took a pension for 13 years while he was a TD and yet he is allowed go around the country promoting a new policy this,” he told RTÉ Radio’s This Week . Mr Martin said he had not resigned from his teaching post in Co Cork since being appointed to the Dail in 1989 but that he did not intend to return to the profession. He said this was because the person substituting for him would lose their job and the school would lose a teacher. Mr Martin said that he would resign at the end of the academic year because “people are raising the last hair” on the subject with him. Responding to Mr Martin’s claims at a Fine Gael rally at the Aviva Stadium this afternoon, Mr Kenny said he will not be accepting any pension from the teaching profession and called on Mr Martin to resign his teaching post tomorrow. Mr Kenny said he had not taken “one red cent” from his former profession in more than 30 years. “Unlike others, my job was resigned by me and was filled on a fully permanent position by some good teacher in my place,” he said. Mr Kenny called on Mr Martin to resign his teaching post “tomorrow morning”. He said he understood the moratorium on public service jobs did not extend to essential frontline positions. “Just in case anybody has any misunderstanding about this, because my situation was as a former teacher in that profession and simply because I paid into a pension fund, “he said. “In case anybody has any illusions that the leader of the Fine Gael party is anyway involved in a money situation here, I will not be accepting any pension from the teaching profession”. He said he hoped those former teachers leaving the Dail on pensions of €100,000 would think about what they were doing. NEW Fianna Fail leader Micheal Martin‘s attempt to promote his new political reform package was overshadowed last night by his refusal to give up his €90,000 pay-off as a former minister. He and the six remaining cabinet ministers will be paid almost €90,000 in severance payments over the next two years, even though they plan to continue as TDs. They will get these payments to ‘compensate’ them for loss of ministerial salaries. Mr Martin confirmed he will not give up these pay-ments, which Fine Gael leader Enda Kenny has promised to abolish for future ministers. The former Foreign Affairs Minister was sucker-punched by Fine Gael yesterday on the sensitive issue of cutting pay and conditions for ministers and was accused of “failing his first personal leadership test”. Additionally, just as he unveiled his plan for “fundamental, radical reform in government and politics”, he also had to defend his past appointment of Celia Larkin to a state board. After this election, former ministers will not pick up pensions if they continue as TDs. But Mr Martin and the six remaining cabinet ministers will pick up payments of €88,745 over the next two years in goodbye money from their time in office. Mr Kenny, meanwhile, said his party’s “radical” plan would “abolish severance pay for ministers leaving office”. It would also cut the Taoiseach’s and ministers’ pay, reduce ministerial pensions, overhaul the expenses regime and ban corporate donations. “Micheal Martin has spoken about reform from the moment he took over the Fianna Fail leadership and he has failed his first personal test on the matter,” a Fine Gael spokesman said last night. Mr Martin is already getting severance pay since he resigned last month. Tanaiste Mary Coughlan and ministers Brian Lenihan, Mary Hanafin, Eamon O Cuiv, Brendan Smith and Pat Carey will also receive the payments once the new government is appointed after the election — if they hold their seats. If they fail to be elected, they will be automatically entitled to a ministerial and TD pension, which is often worth far more. Former ministers receive severance payments for two years to compensate them for the loss of their ministerial salary. The payment is made on top of their TD salary of around €98,000. Ministers who step down receive 75pc of the ministerial part of their salary for six months, 50pc for the next 12 months and 25pc for the next six months — the equivalent of one year’s ministerial salary. Mr Martin said the severance payments being availed of by ministers are no different to the arrangements Labour leader Eamon Gilmore and Mr Kenny received “for a long, long time”. “In particular, Enda would have drawn a ministerial pension while serving as a TD for 13 years,” he said. However, Mr Martin’s attempts to portray his party’s proposals for political reform were yesterday contrasted with his own party’s record in office. His appointment of then Taoiseach Bertie Ahern‘s former partner Celia Larkin to the board of the National Consumer Agency in 2005 prompted accusations of political cronyism from the opposition. Here we have Mr. Martin claiming to represent the big change for Fianna Fail and the rest of the established political parties are claiming to want to bring about change they all tell us that we must continue to produce cuts because the country has no money but it come to their own pensions, salaries, and expenses they all want to keep what they already have and sod the rest of us! And until we the voters send them a clear message they will continue to plunder the state’s coffers and continue to TAX the rest of us to refill them. The economy is dominating election campaigning again today, with Fine Gael pledging to shut down Anglo and Fianna Fáil accusing the Opposition of trying to mislead voters. At an event in Dublin, Fianna Fáil leader Micheál Martin accused Opposition parties of attempting to “deliberately mislead” voters about what changes to the IMF-EU bailout deal can be achieved. Mr Martin said Ireland had to engage in a “respectful way” with colleagues in Europe. He said changing the terms of the deal required building consensus rather than causing conflict. Fine Gael has pledged to shut down Anglo Irish Bank and Irish Nationwide building society by the end of the year and to stop future asset transfers to the National Asset Management Agency (Nama) from the other banks. Publishing its banking policy today, the party also pledges to increase mortgage interest relief for those in negative equity to help the save up to €166 a month. It said the banking plan would bring the sector “back from the brink” and stimulate economic recovery. Finance spokesman Michael Noonan said the party’s aim in government would be to achieve a “well-regulated, competitive, profitable, and privately-owned banking system”. The Labour Party is unveiling its green jobs strategy later today, while Sinn Féin will outline its plans for deficit reduction this afternoon. Meanwhile, the latest Irish Times/ Ipsos MRBI poll shows a Fine Gael-Labour coalition is the most favoured outcome of the election. The poll reveals an almost equal three-way split between the main party leaders as the preferred choice for taoiseach. Asked which of a number of coalition options they would like to see emerge after the election, 34 per cent opted for Fine Gael and Labour, 11 per cent favoured Fine Gael and Independents while 9 per cent wanted Fine Gael and Fianna Fáil. Support for a coalition involving Labour, Sinn Féin and left-leaning parties and Independents came in at 12 per cent. Fianna Fáil and Labour attracted 8 per cent support. Asked which of the coalition options they believed was likely to form the next government 41 per cent opted for Fine Gael and Labour, far ahead of any of the others. Only 5 per cent of voters thought a Fianna Fáil-Fine Gael coalition likely; 4 per cent went for Fine Gael and Independents; and 3 per cent went for Labour, Sinn Féin and left-wing Independents. Asked who they would prefer to see as taoiseach after the election Eamon Gilmore attracted 26 per cent support, followed by Enda Kenny on 24 per cent and Micheál Martin on 23 per cent. Mr Gilmore has dropped 17 per cent since the last Irish Times poll six weeks ago when voters were asked whether they would prefer to see him or Enda Kenny head an alternative government. Mr Kenny is down 4 per cent since that poll. Among voters who say they will not change their minds by election day, Mr Kenny leads with 32 per cent, followed by Mr Gilmore on 30 per cent and Mr Martin on 21 per cent. The poll was taken on Monday and Tuesday of this week among a representative sample of 1,000 voters aged 18 and over, in face-to-face interviews at 100 sampling points in all 43 constituencies. The margin of error is plus or minus 3 per cent. Staff at Permanent TSB are being informed today about the details of planned job cuts at the country’s largest mortgage lender. The loss-making bank, which also announced a 1 per cent increase in its standard variable mortgage rate today, is seeking to reduce its headcount by about 280 and will offer redeployment opportunities to 100 other staff in response to a shrinking banking market and narrower interest margins on loans. The job cuts amount to about a fifth of the company’s staff. The company is seeking the redundancies on a voluntary basis at the head office in Dublin and across the lender’s 92 branches. Permanent TSB said no branches will close as a direct result of this programme. Dave Guinane, chief executive of the lender, said that the bank would seek the redundancies as part of a plan to “secure the future” of the company. The company, which employs 1,850 people, has reduced its workforce by about 400 over the past two years through smaller redundancy programmes and by not replacing departing staff. The Unite trade union said it was a “dark day” for staff, and criticised previous senior management for the situation. Consultancy firm Accenture carried out a review of Permanent TSB revenue and costs last year. The lender had planned to make an announcement once a decision had been made on the sale of rival EBS, of which Permanent TSB is one of two final bidders. The company decided to bring forward the redundancy announcement due to the delay in the Government’s sale of EBS. Similar-sized reductions in staff numbers at the main banks, Bank of Ireland and AIB, would lead to a total of about 8,000 job losses across the two institutions. Larry Broderick, general secretary of the Irish Bank Officials’ Association, said that almost 7,000 jobs had been lost at the banks since the autumn of 2008 and at least 2,000 more would be cut “in the near future”. Brian Cowen will leave office with a golden handshake worth more than €300,000. He has racked up to 27 years’ service in the Dail which means he qualifies for a full TD pension of €50,000, coupled with his ministerial pension of around €100,000. Mr Cowen (51) will also receive a lump sum payment of about €150,000 and a termination payment of €16,000. During his tenure as Taoiseach, Mr Cowen saw his salary slashed from €185,000 to €135,000 as part of the Government’s pledge to share the pain with the electorate. However, his pension payment is based on the salary level before the cut. In addition, he is entitled to a State car with a driver. EMBATTLED Taoiseach Brian Cowen was an increasingly isolated figure in Fianna Fail last night as his party’s grassroots turned against him. Mr Cowen fended off the growing demands to resign as Eamon O Cuiv, the champion of Fianna Fail loyalists, refused to back the Taoiseach. The Taoiseach faces into a second weekend of intense pressure on his leadership of the party following his botched reshuffle crisis. And there was speculation within Fianna Fail that Mr Cowen would be approached by close friends in the party over the weekend and told it was time to resign. In a sign of the growing uncertainty in the Coalition, the Green Party did not guarantee to vote for the Government in the motion of no confidence next week. The junior coalition party opted to wait until Tuesday to decide after seeing how the weekend’s events panned out. A party source said these were not “ordinary times” and the party was evaluating the situation on a day-to-day basis. Defeated leadership challenger Micheal Martin urged the party’s TDs to “think about what has happened and begin to chart a way forward very quickly”. But the former Foreign Affairs Minister ruled out launching another challenge to Mr Cowen. The Taoiseach’s own supporters conceded his position appeared to be becoming untenable yesterday morning, but as the day went on, he fought back. Mr Cowen stubbornly insisted he would lead his bitterly divided party into the general election on March 11 as he categorically refused to step down. Fianna Fail TDs have reported being savaged by members following the reshuffle affair. And support for Mr Cowen wavered as TDs who backed him in the confidence motion reconsidered their positions. A string of others who publicly backed Mr Cowen before Tuesday’s confidence vote would not answer calls yesterday or publicly support him. The shift in support among those who backed Mr Cowen casts further doubts on his position as party leader. And a number of TDs said they were spending the weekend starting their election campaigns. Fianna Fail TDs also reported dismay in the party grassroots over Thursday’s reshuffle fiasco, with one minister saying that party activists “to a man and woman” are raging. Mr Cowen shrugged off suggestions of a threat to his leadership by insisting he would lead Fianna Fail into the general election. He tried to move on from the controversy over his botched reshuffle by saying “that issue is over”. He also announced he would be creating a new Fianna Fail “frontbench” instead — so that younger TDs in the party could become spokespeople in portfolios ahead of the election. “I have the support of my party, as confirmed by democratic decision last Tuesday, to lead this party into this election and beyond, and that’s what I intend to do,” Mr Cowen said. After backing Mr Cowen earlier this week, Mr O Cuiv yesterday refused to say he had confidence in the Taoiseach when speaking in person to the Irish Independent. The Social Protection Minister’s stance is viewed as significant as he is regarded as being most in touch with Fianna Fail grassroots membership. The grandson of the party’s founder, Eamon de Valera, is always staunchly loyal to Fianna Fail and defends the party to the hilt from attack. Mr O Cuiv’s reluctance to back Mr Cowen is a real sign the party membership has now turned on the Taoiseach. After being the first cabinet minister to publicly back the Taoiseach last Sunday, when Mr Cowen put down a motion of confidence in himself, Mr O Cuiv refused to endorse his leader yesterday. At the opening of a Brothers of Charity day-care centre in Furbo, Galway, Mr O Cuiv was directly asked if he still had confidence in Mr Cowen as Fianna Fail leader. “I have no comment,” Mr O Cuiv said. Mr O Cuiv also surprisingly declined to be interviewed on Raidio na Gaeltachta. He frequently avails of the opportunity to speak to station listeners in his Connemara heartland. Former minister Willie O’Dea has again warned of an electoral catastrophe for the party if Mr Cowen leads it into the general election. Conor Lenihan, Michael McGrath, Thomas Byrne, Ned O’Keeffe and others all want Mr Cowen to resign. It’s far too late these so called supporters are every bit as blind as the last fanatical followers of Hitler in the Berlin bunker in the last days of the war.